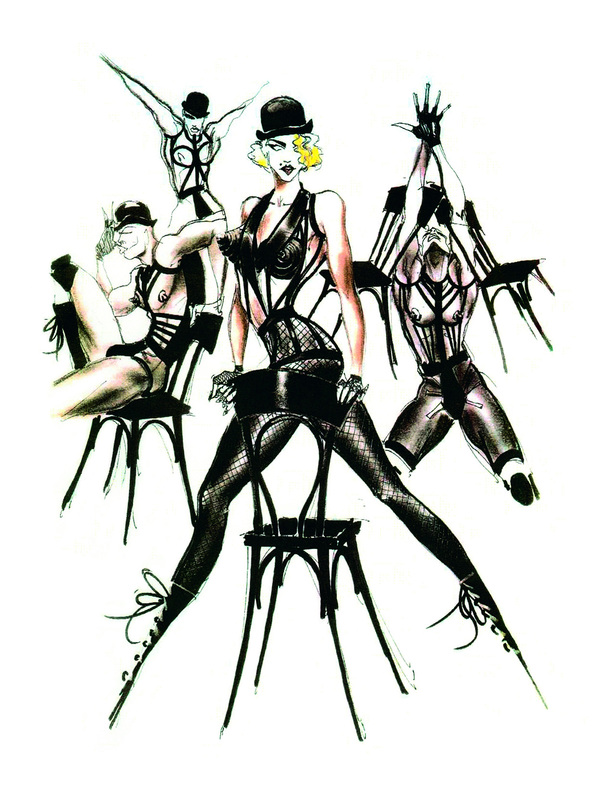 The costumes that Jean Paul Gaultier designed for the finale of Madonna’s « Blond Ambition World Tour », in 1990, when she performed « Keep It Together », were based on Stanley Kubrick’s « A Clockwork Orange » and Bob Fosse’s « Cabaret ». Other « A Clockwork Orange »-influenced collections : Alexander McQueen Autumn/Winter 2009-2010 Menswear (this collection sometimes echoed « A Clockwork Orange »), Avakian (in April 2008, Avakian unveiled a collection, at the Australian Fashion Week, which was based on « A Clockwork Orange »), John Galliano Autumn/Winter 2006-2007 Menswear (STYLE.com wrote that the start of this show was « Oliver Twist meets A Clockwork Orange »), Limi Feu Spring/Summer 2011 (the bowler hats, Droog-inspired eyelashes and Doc Martens-style boots evoked « A Clockwork Orange »), Moschino Autumn/Winter 2012-2013 Menswear (the 1st look of this show echoed « A Clockwork Orange »), Rachael Hall Autumn/Winter 2012-2013 (the knitted pieces of this collection, presented on May 31, 2012, as part of the London’s Royal College of Art MA, paid homage to « A Clockwork Orange »), Rodnik Spring/Summer 2008 (this collection was a tribute to « A Clockwork Orange »). To read about Madonna-inspired collections or Madonna’s collaborations, search for the « Madonna » post that I published on September 4, 2012. A bit random….I ran into a “Clockwork Orange” Hello Kitty doll the other day. An interesting book, an interesting movie, an interesting influence on fashion. Thank you ! I hope that Fashion Mayann expresses the eclecticism of designers’ inspirations and of my own tastes ! that sounds absolutely incredible!! lucky you!